juggling | The Solar Nerd. To connect with people is a great blessing, indeed. 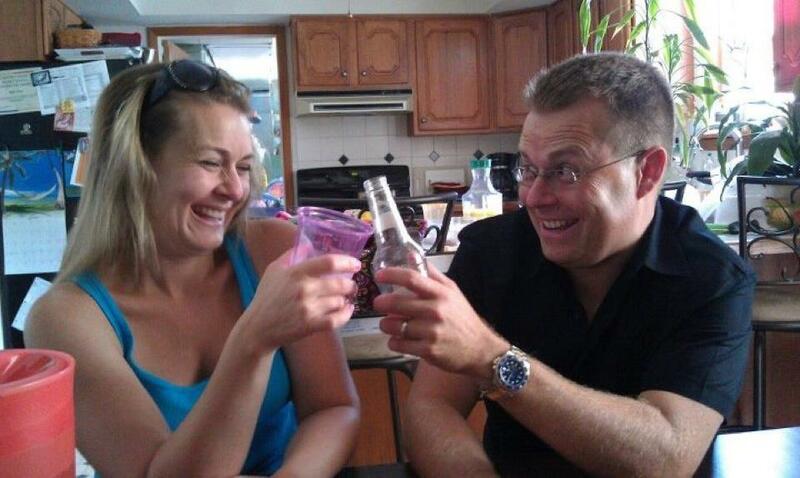 This is me and my sister Andrea in her kitchen in New Jersey, about 2 years ago. We were joking around that day, I was talking about goofy stuff and making her laugh, probably because I had said something outrageous…. Andrea’s husband Jerry took the pic and it captured that specific moment perfectly. It’s important that we connect with other people, every day, in a non-social media way. I spent this morning interviewing applicants for an admin position within Balloon Distractions, I met a bunch of nice folks, and in the process had some lively discussions with a pretty diverse group of people. One applicant had been a detective in London, who knew? Social media has it’s place and it’s utility, but let’s not substitute this for REAL human interaction. This is one reason why I enjoy volunteering in local community events, it gets you out there meeting people and interacting with real human beings, not staring at a computer screen. Commenting to a post on Facebook is nice, but sharing a laugh with someone in person is far more powerful. Those are my thoughts for this afternoon…. Tuesday afternoon, February 11, 2014. 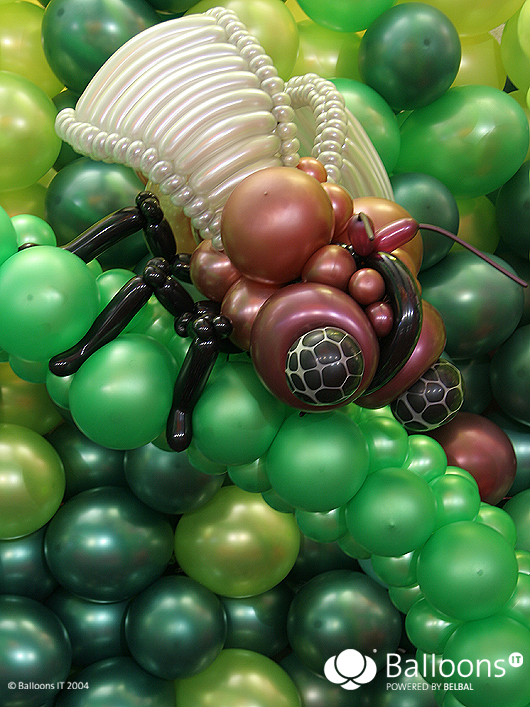 The Unlimited Creativity of the Ballooniverse. 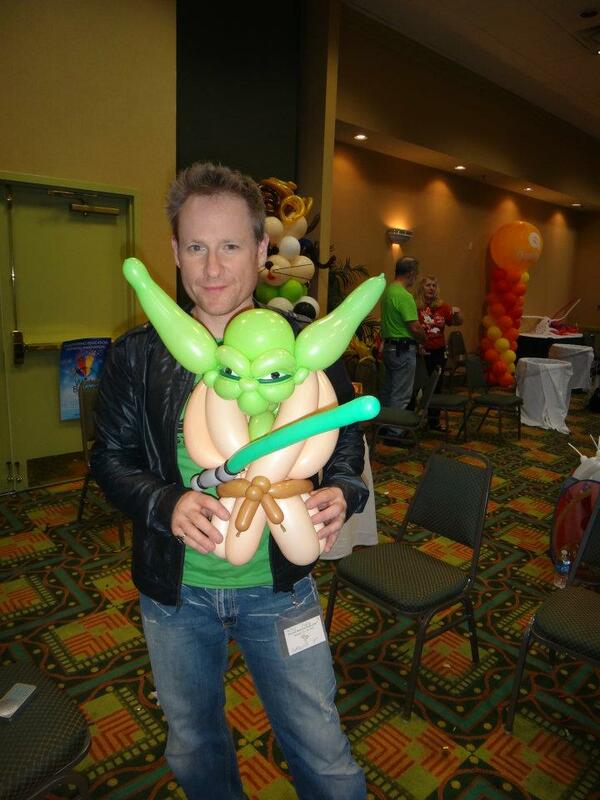 Famous balloon artist Jason Szabo and his amazing Yoda…. Previous to that there were a few basic books and some small conventions around the world, but once the folks in the Ballooniverse started to collaborate there was an explosion of new ideas. Balloon Distractions has had over 4,000 people learn balloon twisting in our organization since 2003, so we’ve been a small part of the expansion of the Ballooniverse, no pun intended! 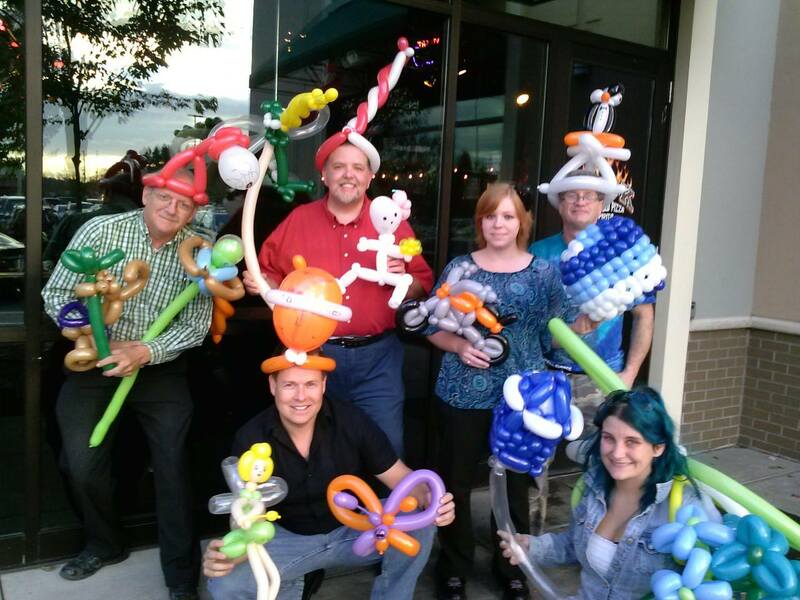 Twisting balloons in restaurants is a great way to get very fluent at the art and earn some decent cash as well, the CEO of our company worked in restaurants during his last 2 years of college and graduated with no student debt! Balloons represent a colorful medium for creativity all over the world, and we are proud to be a part of it! 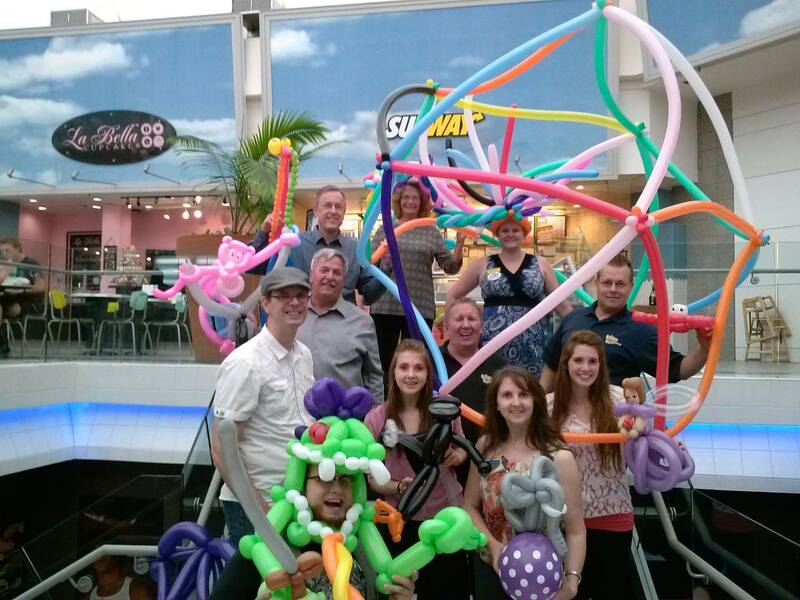 Balloon Jams from Seattle to Schenectady! Balloon Jam in DFW, August 2013. Balloon Jam in Seattle, November 2013. Balloon Jam in Los Angeles, September 2013. Balloon Jam in upstate NY, July 2013. Between April and October of 2013 I was fortunate enough to visit every single region that we do business with across the United States. I did not get a pic at every jam (maybe in 2014?) but I got a few that really captured some great moments with our teams. Traveling around and training our Regional Partners and meeting their amazing teams is a big part of what I do as the owner of the company, and a great joy for me as well. Our teams are a great mix of college kids, stay at home Moms and military veterans who have joined us to make great part time money and have a ton of fun as well. Paid Baritone for a Presbyterian church. Insurance agent for Mutual of Omaha. Basic construction, ripping up sidewalks, building fences, etc. Art model for my college’s life modeling class. Balloon Twister 4 Tips in countless restaurants. Owner of a balloon twisting talent agency. Burger flipper at Dairy Queen. Waiter at many different restaurants. Lifeguard at several lakes and pools across South Jersey. Selling gold plating services to car dealerships. Selling deregulated energy door to door. Managing large door to door crews that sold deregulated energy. Selling underwater scuba camera equipment over the phone. Selling mortgages over the phone. Selling employment advertising over the phone. Selling solar and energy efficiency door to door, in NJ, PA and FL. Selling cars (mostly Toyota) in MD and FL. Mowing lawns and basic landscaping. Delivery driver for Naple’s pizza in Mullica Hill. Package sorter on the midnight shift at UPS. Direct Sales with Amway and Life Leadership. Getting paid from sales of my first book on Amazon. Sales consulting for 2 marketing firms in Philadelphia. Goofed off with the EB-5 investment program in Taiwan, never made a dime. Imported Super Sonic Spheres from Taiwan, same result as #30. I’ve tried so many unusual things in my life that nothing is that weird or unfamiliar. In college every single time I got fired from one job (I had a big mouth and it got me in hot water) I would look around and try something different. I feel bad for the person who turns 18, gets a job that he hates, then stays in that job for 40 years because he is hooked to a measly paycheck. How boring, right? Be open to new ideas and experiences, and as you get older you will continually expand your comfort zone. When you stretch yourself you will learn how to be resilient and adjust to anything. Trying many different things also teaches you to be resourceful, a great quality to develop whether you are an entrepreneur, teacher or any profession. Once you’ve taken off every stitch of clothing in front of a room full of art students, or traveled 12 time zones away on a ONE WAY ticket to a foreign country to work, everything else is small potatoes. I started Balloon Distractions (when I was 29) because I never found a job that I actually liked. Previous to that I could never hold a job longer than 24 months. 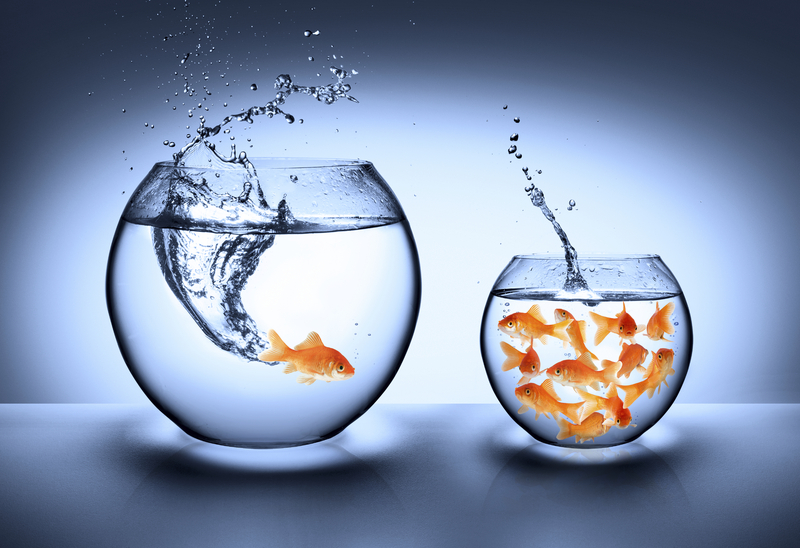 When you move OUT, way OUT, from your comfort zone you will gain tremendous confidence and trust in yourself. After living in Taiwan and learning how to speak a bit of Mandarin Chinese I was not afraid to live somewhere very far from what I knew growing up. Moving to Florida in 2003? No big deal, at least it’s still in the USA. Consequently I feel at home everywhere I go here in the States. The entire USA is within my comfort zone. As I traveled around the United States building Balloon Distractions I always felt at home, whether in Seattle, Miami or Houston. A little job or hobby that you try out in college can lead to something significant down the road. When I was twisting balloons in college I never would have guessed that it would lead to Balloon Distractions. More recently I got involved in residential and commercial solar with Tampa Bay Solar. Here I was, learning a totally new industry at 43 years old! I’ve been making a great income and learning a ton. I feel like a million bucks. Be thrilled by the potential of the unexpected, and don’t hesitate to get out of your own comfort zone! The only thing you risk by trying something new is loss of time. blog was originally written in 2014, updated in May of 2017. 17 year locusts and Sacred Geometry. The more I read and travel the more I run into the inherent strangeness that is out there in our everyday world. The UNIVERSE has ALWAYS been multi-faceted and bizarre, and the oddest things are not always that obvious at first glance. Sacred Geometry can be applied to modern business in many ways…. it is used to influence and persuade the general public in such a manner that we do not realize we are being influenced. Lots of weirdness also sits on the Internet, waiting to be discovered. If you get curious about Ch’an Buddhism you are 2 clicks away from digital pics, video and a few blogs about it as well. With platforms like Facebook you can post a weird YouTube clip on your Wall and share it with the 8 bazillion people linked to your profile… in many ways technology facilitates the rise of stuff that most people would never know about before the internet. I work from a home office and when I glanced out of the window yesterday there were 2 lizards (brown anoles) getting funky on the windowsill overlooking the garden. I’ve lived in Florida since 2003, I’ve seen them procreate before, but I still stopped for a minute and watched. I’ve observed these little lizards hunt bugs for food, fight each other, get eaten by birds, and when they molt they will eat their own cast off skin! Disgusting, yes, but a bit fascinating as well. The entire lizard soap opera unfolds right in the rose garden, from procreation to death. I’ve never seen a Cicada in North America with this interesting coloration. When I visited Taiwan in July of 2010 I saw and heard plenty of stuff that one would not normally find here in Florida: tropical mountains, pet squirrels, cable cars that went high into the clouds, Hakka, Mandarin and Taiwanese spoken around me, bullet trains and snakes for sale as food at the night market. One key to a dynamic life? Stay curious and question stuff… and observe the world around you with fresh eyes. A small business can only give so much to the local community, but a national business that generates 10 or 50 or even 100 million dollars per year can do so much more. When I started BD it was just a concept in my imagination, a wild idea with which I had no idea whether it would work or not. As I write this today we provide a living for many of our Regional Partners and great part time income for the high school and college kids on our teams across 42 cities. It all started with a crazy idea in 2003… a tiny seed that sprouted into a nationwide business. I have another crazy idea and I’d like to share it with you. If you are brand-new to our company this idea might have an impact on your life, as well as the people you bring on and train as you move up through our system. 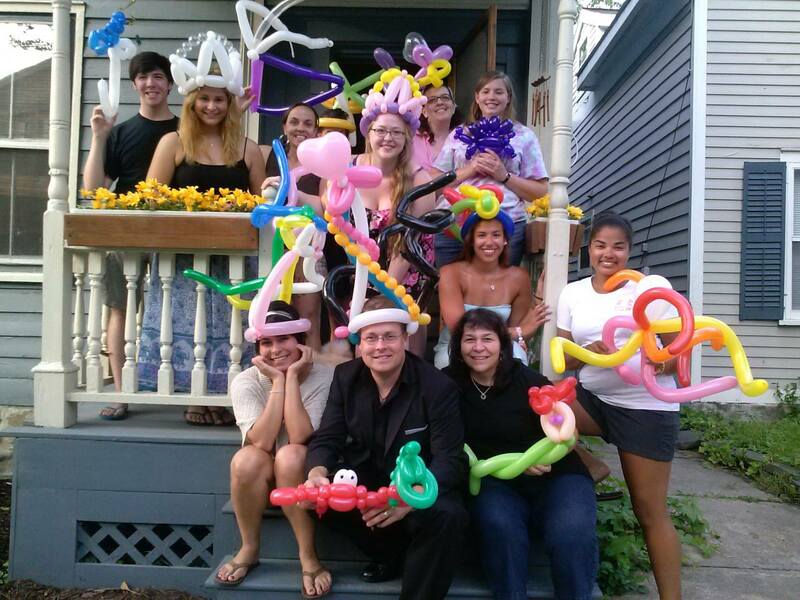 Imagine for a moment that we have scaled up to 200 regions across the United States and we start opening day camps each summer that employ our balloon artists as counselors and teach children positive thinking, balloon twisting, face painting, comedy, magic and (maybe even) juggling. Our counselors would make a great hourly wage each summer and our camps would be a great training ground for our next generation of entertainers. Our summer camps will be unique, fun, and cater to that offbeat child who might not fit in at soccer, cheerleading or football camp. To GIVE BACK we would offer 20% of the enrollment at a reduced rate (or free) to kids in the neighborhood who normally would not get to enjoy such a neat experience. What kind of impact would BD have if we gave a child from a rough background the opportunity to learn something joyful like balloon art, magic or face painting? What if we encouraged that child to get better each summer and brought them on as an entertainer when they turned 16 years old? … What IF when that child reached 18 they were awarded a Balloon Distractions scholarship to help them get through college? Could we take a child “under our wing” so to speak and change that child’s trajectory into adulthood? 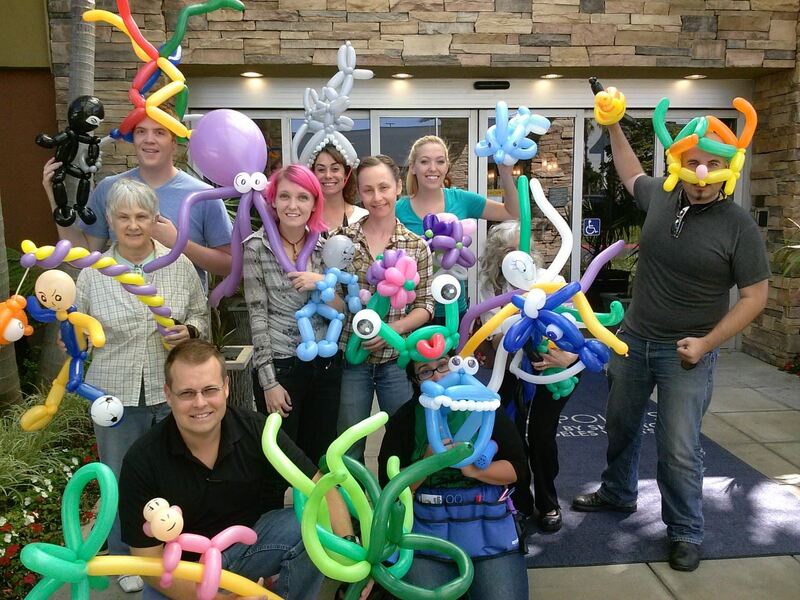 Could a little BALLOON talent agency do ALL that? As I write this we are like a small lever that provides a modest income for 300 members of our team, but when we are in 200 cities with 10,000 children in summers camps we can do AMAZING things. Balloon Distractions then becomes a huge lever that can do great things and impact the lives of thousands of children in a positive way. Granting 100K in annual college scholarships is not possible at our current size, but is becomes tenable when we are in every city in North America. If you are reading this as a new member of our team consider the impact that YOU can have in the life of a child. Perhaps your Faith called you to join on our team and to lend your talents to our mission. Balloon Distractions does AMAZING things in the lives of the children we entertain, the college students and Regional partners who earn an income from this business model and the lives we save through our clean water efforts in Central America. The bottom line profit is important in any business, but with Balloon Distractions you are a part of a higher purpose than just making money. In my personal life I don’t need a bunch of fancy JUNK with which to impress people. My greatest reward will be going to the college graduation of a young person who entered our summer camps as a child with NO CHANCE in life, knowing that my company gave him that shot at success, an opportunity to learn, grow and work hard to see tangible results at the end of the day… or when I’m in Honduras and make a balloon for a child who is healthy and thriving because they have clean water to drink. The summer camp concept will take a few years to fully develop, but if you are a Regional Partner right now consider the fact that you are already teaching your team a skill that enables them to go out and average over $20 an hour in income on a regular basis, and over $50 an hour when they perform at special events. That skill will also make your team well suited to working as camp counselors once the summer camp concept is launched in your region. As a Regional Partner you are making a positive difference in the lives of all the people you train and develop, and you can’t predict the end result of teaching just one person this new skill. I’m sure the guy who trained me back in the 1997 had no clue that I would go on to start a company, and that BD would go on to train over 4,000 balloon artists so far. I only go out to sell if there is someone to watch and learn from me, in that way I train someone and sell new business at the same time, a very productive use of my time because most of the people I train will then go out and sell business when I am NOT there. In most JOBS you work 8 hours and get paid for 8 hours of work and that’s it. I have not had a job since 2003 and I probably never will for the rest of my life. I know now that I’ll be an entrepreneur for the rest of my life, no doubt. You can work at a job for 20 years, then one day you get fired and you have….. nothing. Lots of people are learning that painful lesson right now. If you build a business for 20 years you can turn around and sell it for double the current yearly revenue. That means that my little entertainment company is now worth 400 to 500K if I were to sell it today. You can’t sell your job…. The trick is to find a business that will earn you a residual income and allow you to duplicate your effort many times over. That’s exactly what Balloon Distractions does, train a crew, send them out to restaurants, and make income while you are asleep. We all have the same 24 hours a day to live in, from Bill Gates to a homeless guy. Bill Gates is a billionaire because he built a huge business that sold a product to millions of consumers.